Urban decorative wall registers are made out of a durable cast aluminum that will not rust! Use this aluminum air vent in your kitchen or bathroom renovation to heat or cool the room. This decorative wall register comes bare, but can be primed and painted to match any room's style. Please note the aluminum air vent is non returnable once it has been painted. If your decorative wall register is left in its aluminum form, it may oxidize over time. The aluminum air vent body is handcrafted and custom made every time and has the rustic appearance of something hand cut. Use this decorative wall register, which comes with a steel damper, on your ceiling or wall to control the airflow in your room. These aluminum air vents can also be used indoors or outdoors. Please note the listed size is by your walls hole opening and that the register can be made with or without screw holes. Important: Because these aluminum air vents are handcrafted, it can 3 to 4 weeks for your order to ship once placed. 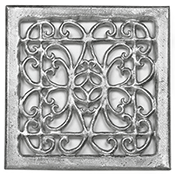 The decorative wall register will come in bare aluminum and can be painted if you choose. If it is not painted, please note that over time a layer of oxide may form on the grille. Once painted, item is non returnable. Tip: When ordering the aluminum air vent, make sure to order according to the hole opening you are measuring. Do not take a measurement of your old grill when ordering. The 10 x 10 decorative wall register will fit into a hole that measures 10 x 10 but will have a faceplate measurement of 11 1/4 x 11 1/4 inches. The faceplate of the register measures approximately 1/4" and the damper drops in approximately 2". Check out our aluminum air vents without the damper for those looking for just an open return air vent. Unique decorative wall registers are your opportunity to spruce up your style without changing your entire decor! Order now.